Can I take the course with an out of State license? How do I order a new course completion card? Are the courses designed for beginners or experienced riders? What is the Basic Rider Course (BRC)? How long is the BRC? How much does the BRC cost? Do I need a motorcycle for the BRC? What do I need to register for a BRC? Are private BRC lessons available? Do I have to take the Dept. of Motor Vehicles riding test to get my motorcycle license? What skills do I need before I take the BRC? Do all the students pass the BRC? What is the Experienced Rider Course (ERC)? How long is the ERC? How much does the ERC cost? Do I need a motorcycle for the ERC? What do I need to register for the ERC? Do I get an insurance discount? What do I need to bring with me to the class? Do I have to attend the complete course? What type of schedules are offered? Where are the courses offered? How do I get registration information? 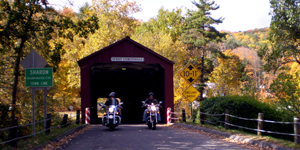 The Department of Transportation's Connecticut Rider Education Program (CONREP) was established in 1982 by Public Act 82-333. 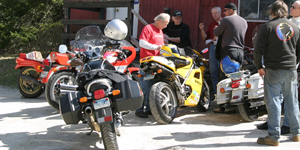 The Program's goal is to provide quality motorcycle training for new and experienced riders. Over 40,000 students have registered for these courses since 1984. We offer courses to accommodate both beginner (BRC) and experienced ERC riders. The Basic Rider Course (BRC) is designed to help individuals with little or no riding experience achieve a better understanding of what is involved in operating a motorcycle. 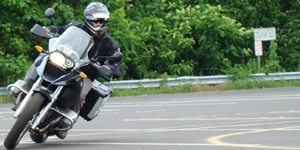 The BRC begins with the development of the fundamental riding skills of turning, shifting and braking, and expands these basic skills into more advanced street-riding techniques. The course consists of six hours of classroom instruction and eleven hours of on-cycle instruction. No. Training motorcycles, ranging in size from 125cc's to 550cc's, are provided for BRC students. Participants must have a valid automobile driver's license or a motorcycle learner's permit or a driver's education completion certificate. Participants less than 18 years old must have a parent or guardian sign a waiver. Yes. Some sites offer private lessons on a limited basis. Students who successfully complete the BRC, will be given a waiver, which exempts the student from having to take the Department of Motor Vehicles on-cycle skills test for licensing. The knowledge skills portion and the appropriate fees are still required. Riding a motorcycle is much more difficult than riding a bicycle or operating a car. It involves a great deal of hand/eye coordination. You must be able to balance a two-wheeled vehicle. If not, please practice before attending. Always come to class in good physical condition well rested, attentive and able to fully participate. On average about 70% of enrollees successfully complete this course. 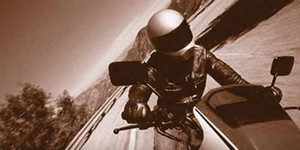 During the course you may discover or be informed that riding a motorcycle is not for you. For your safety and the safety of others, the instructor may not allow you to continue. The Experienced Rider Course (ERC) is a course designed for licensed riders with more than 500 miles of riding experience. 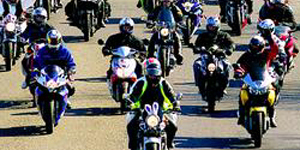 Participants must have a motorcycle license and a motorcycle to ride to (and during) class. 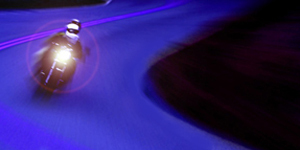 This is your chance to practice "survival skills" and explore traction management, swerving, cornering, and braking techniques. 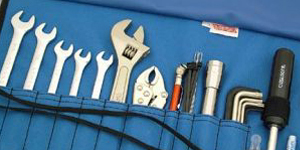 The ERC is a one day, six-and-a-half hour on-cycle training course. Yes you are required to ride your own street legal motorcycle to and during the ERC. 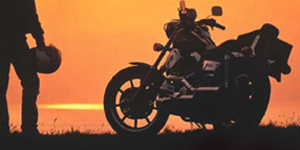 You will also be required to present proof of State required motorcycle insurance coverage for said motorcycle. Upon successful completion of any of our courses, students are entitled to a 10% insurance discount; please contact your agent for details. Classes are conducted in all weather conditions, so come to each session prepared! Bring rain gear, warm clothes (for cold days), water, lunch and a snack. Your own DOT approved helmet is recommended, but one is available if needed. Also a long-sleeved shirt or jacket; full-fingered gloves (leather preferred); long, ankle-length pants (denim or other heavy material); sturdy boots or leather athletic shoes (over-the-ankle style). Some form of eye protection; face shield, sun glasses, prescription glasses or safety glasses. You must attend and participate in all sessions. If you know you will miss a session for any reason, do not enroll in that time slot; choose another session. Each training site begins registration in March and continues training into November. We offer a variety of course schedules. The most common is our two weekend schedule Thursday Night / All Day Saturday or Friday Night /All Day Sunday. We also offer classes weekdays and evenings at some locations. We offer courses in the following locations: Manchester, East Granby Farmington, Groton, Hamden, Hartford, North Haven, Plainfield, Stratford, and Torrington. Click here for course registration contact information.